Absent a threat with the menace to drive the story forward, Curse of the Faceless Man is powered instead by backstory. Six people with various doctorates spend the majority of the film standing in cramped rooms, speculating wildly about the possible origins and abilities of a stone mummy unearthed at a nearby dig in Pompeii. Occasionally, Tina, the fiancée of one of the doctors, joins in, but unknown to anyone (even Tina), she has a psychic connection with the Faceless Man, which is more than can be said for the connection she has with her stiff of a boyfriend, Paul. Much of Curse of the Faceless Man plays like an extended sequence from What’s My Line? First, there’s a series of questions, hypotheses, wild guesses, and then—ding!—someone figures out the answer, and the film advances to the next scene. This relentless speculation could be over looked if it was an excuse to photograph scenic locations in and around Pompeii. But this is not the case. 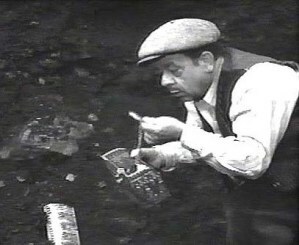 One man digging a hole stands in for an entire archeological excavation. A plaque in front of a building, which is clearly Griffith Observatory, proclaims itself to be the Museo di Pompeii Napoli. Finally, in a desperate bid to convince the audience they are somewhere other than Southern California, the same boxy European cars turn up scene after scene, inexplicably driving down roads not in Pompeii but in Griffith Park or on the Pacific Coast Highway. Eventually, the film dispenses—not only with the idea of rising action—but with the idea of “action” of any kind. Freed from the twin burdens of believable dialogue and character development, the filmmakers deliver the exposition in the most direct and economical way possible: a reel-to-reel tape recorder. Dr. Emmanuel (one of the many “doctors” in the film) hypnotizes and regresses Tina back to an earlier life. Later, he invites Paul, Tina’s fiancée, to his office so Paul can listen to the tape recording that was made. Tina’s flat, emotionless voice fills the room, and the camera stubbornly holds on a tight shot of the tape recorder, only occasionally cutting away to reaction shots of Dr. Emmanuel and Paul. The following is an example of how possible unused footage might have been edited together. TAPE RECORDER (Tina’s voice): The skies have been dark since yesterday when Father returned from the senate in Rome. I feel that something terrible is going to happen. Dr. Emmanuel holds a finger up to his lips—gesturing for silence. There’s been no rain. No clouds. Just the gray light over Pompeii that depresses me as I look through my window at Vesuvius and remember the curse placed upon my family by the slave Quintus Aquarius. He appears deep in thought, possibly weighing what action to take. The camera tilts down to a pad of paper on a desk. On it is written: Drop off suit at cleaners. Pick up cat food from store. Check out Stabian baths. I fear the slave and his strength, for he is the most powerful gladiator in all the empire. He has threatened to escape his cell and take me from my house. hunched over the desk, assembling a five-masted schooner inside of a glass bottle. Yet, how can I return his love? I am an aristocrat. He is a slave. It is not . . . there—is that a rumbling in the ground? The house shakes. Dr. Emmanuel hands a gun to Paul. Paul spins the cylinder and holds the gun up to his head. There is a moment’s hesitation, followed by a look of disappointment as the hammer comes down on an empty chamber. Paul hands the gun back to Dr. Emmanuel. I hear shouts in the streets. It is a volcano. It is Vesuvius. Our house is falling above me . . Confronted with the problem of reuniting the plodding mummy with his reincarnated lover, the undramatic but ultimately time-saving decision is made to have Tina come to the Faceless Man (who the doctors have managed to capture and restrain). In a hypnotic daze, Tina frees him from his leather bonds and then faints, setting off what must be a kind of Pavlovian response in mummies, the Faceless Man immediately taking her up in his arms. He deliberately puts one stone foot in front of the other and starts off on the slow, unbelievably tedious journey to the beach—15 miles away! gathered around a phone, waiting for it to ring. The doctors look spent, drained of all hypotheses and backstory, unable to advance the story any longer through word or action. All they can do is wait . . .
Until finally, the phone rings! Having dispensed with the idea of “rising action,” the film, in a heady disregard for audience expectations, turns its back on anything that might conceivably pass for a climax. The Faceless Man, reliving his actions on the day Vesuvius exploded, hits the beach at exactly the same moment the boxy European police cars pull up onto the sand. Paul and the inspector, along with the doctors and the entire police force of four men, spill out of the cars and race across the beach. The Faceless Man backhands one of the policemen in the face and, with Tina still in his arms, heads for the surf, where he . . . Well . . . where he begins to fizz and dissolve like a giant Alka-Seltzer tablet. Really. 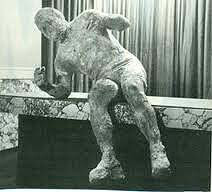 In nothing flat, the stone mummy is gone. As it turns out, Tina remembers nothing of what has happened, and in a completely unexpected turn of events, Paul passes up the opportunity for a long-winded explanation, instead deciding it’s “just as well” she has no memory of the Faceless Man. One can only guess at the fate that awaited Tina if Paul and the doctors hadn’t arrived when they did. Actually, that isn’t quite true. It’s fairly obvious what would have happened. The Faceless Man would have carried Tina into the water. He would have dissolved, and Tina, finding herself alone on the beach at dawn, would have been forced to thumb a ride back to town. Not the most horrible fate imaginable, but certainly inconvenient. 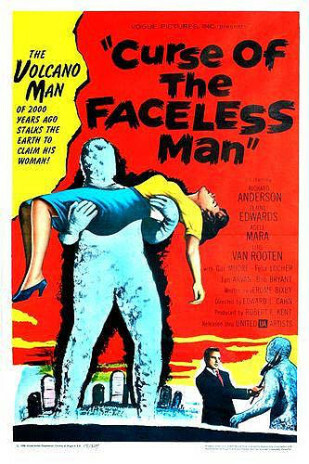 One reason Curse of the Faceless Man is such a disappointment is because it was written by Jerome Bixby and directed by Edward L. Cahn, the creative team responsible for It! The Terror from Beyond Space. While It! is a classic example of a B movie overcoming the limitations of a low budget with talent and imagination, Curse of the Faceless Man, at best, is perfunctory and, at worst, lazy and amateurish. Not every effort can be a home run, but this isn’t even a bunt. 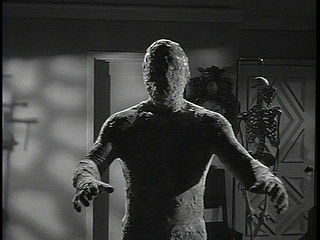 In any case, Curse of the Faceless Man remains a cautionary tale for anyone thinking about making a mummy movie. The lesson? Don’t. That’s all there is to it—don’t. Jerome Bixby wrote many science fiction and horror films, but one of his odder efforts was a movie called The Lost Missile. While more fun and entertaining than Curse of the Faceless Man, it is also weirdly wrongheaded in its bizarre story choices. A missile from somewhere in outer space (it’s never revealed where it came from or why) circles the earth, leaving a charred swath of destruction in its wake. Unfortunately, the threat posed by the missile is so arbitrary and unlikely it’s impossible to take seriously; it doesn’t even work as a metaphor for nuclear war. In some ways, the film is ahead of its time in foregrounding women’s issues and concerns, but unaccountably, it manages to do so in a way that makes them look both selfish and silly. 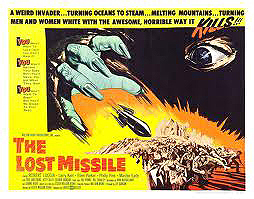 The Lost Missile is one of a kind, and I do my best to make sense of it in my audio review.